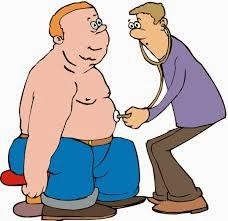 Obesity results from the excessive accumulation of fat that exceeds the body's skeletal and physical standards. According to the National Institutes of Health (NIH), an increase in 20 percent or more above your ideal body weight is the point at which excess weight becomes a health risk. •	Between 12 and 18 months of age. •	Between 12 and 16 years of age. •	Adulthood when a person gains in excess of 60% of their ideal body weight. During these periods, an excessive amount of weight gain causes an increased number of fat cells. Once a fat cell is formed, you generally cannot get rid of it. What causes one person to gain weight while another person maintains their weight? As a general rule, as you grow older, your metabolic rate slows down and you do not require as many calories to maintain your weight. People frequently state that they eat the same and do the same activities as they did when they were 20 years old, but at 40, are gaining weight. This will happen. Metabolism slows down with advancing age. Gender is also an important factor. Males have a higher resting metabolic rate than females, so males require more calories to maintain their body weight. This higher resting metabolic rate is primarily due to the increased lean body mass (mainly muscle tissue) males have compared to women. Active individuals require more calories than less active ones. Physical activity tends to diminish appetite in obese individuals while increasing the body's ability to preferentially metabolize fat as an energy source. It is believed that much of the increase in obesity in the last 30 years has resulted from the decreased level of physical activity in everyday life (such as emailing coworkers instead of walking over to their desks). However, the relationship between physical activity and weight is more complex and is discussed in more detail in another section. Heavier people require more calories to maintain their body weights than lighter ones. For example, a middle-aged male weighting 250 lbs. doing minimal amounts of physical activity may require 2700 calories to maintain his body weight. If this person goes on a 2000 calorie-per-day diet, he will lose weight. Eventually, however, even if he stays with a 2000-calorie daily diet, his weight will stabilize because his metabolic rate will gradually decrease. When this man reaches approximately 200 lbs., he will require perhaps only about 2000 calories per day to maintain his new weight. This reduction in metabolic rate is a normal process and takes place in all individuals. High saturated fat foods are obesity-promoting in animals and humans. In the last 40 years, the ready availability of these high saturated fat foods (such as, "fast foods"), combined with the decreased calorie requirements from decreased physical activity, is felt to be the major factor in the sharp rise in the prevalence of obesity. Some fats, especially the very long-chain omega-3 fats EPA (eicosapentaenoic acid) and DHA (docosahexaenoic acid), commonly found in fatty fish, are not obesity promoting and can, when incorporated into the diet, actually help reduce body weight and improve health. Certain medications prescribed for inflammatory conditions, seizures, and mental illness tend to increase appetite and may also decrease metabolic rate. Heredity is associated not only with obesity, but also with thinness. It most closely correlates with the biological mother's weight. If the biological mother is heavy as an adult, there is approximately a 75% chance that her children will be heavy. If the biological mother is thin, there is also a 75% chance that her children will be thin. It is related to metabolic processes inherited primarily from the biological mother. These differences are independent of thyroid activity which, incidentally, is a relatively rare cause of obesity. A tendency to be obese is actually of survival value. If a person tends to be obese, he or she may have a more efficient metabolism, which means that they can survive on less food. In times of famine, people with this more efficient metabolism can survive on fewer calories. In most countries, adequate food, much of it high fat, is relatively plentiful for the majority of the population, making a more efficient metabolism a disadvantage contributing to the obese state. Hereditary factors are a major factor contributing to obesity. Incidentally, inheriting a tendency toward obesity does not mean that you cannot lose weight - it just means that you have to work harder at it. Obesity is a serious disease that can lead to many medical complications, such as adult onset diabetes, hypertension ("high blood pressure"), sleep apnea, elevated cholesterol and triglycerides ("fats"), and several other common medical conditions. Losing and managing a lower body weight would seem rather simplistic...you just cut-down of your calorie intake and increase your energy expenditure. However, it isn't so simple. This approach assumes that overweight and obesity are volitional disorders...they are not. Nobody in a Western society chooses to be obese. Furthermore, once caloric intake is decreased, multiple compensatory mechanisms result in decreased caloric requirements. Dietary Changes - Higher protein/low saturated fat diets: Many scientific studies suggest that eating a diet that is higher in protein is associated with better short-term and long-term weight loss. All foods are composed of the following nutrients: Protein, carbohydrates, and fats. Both protein and carbohydrate have about 4 calories per gram, while fat has more than twice the calories at 9 calories per gram. Most studies show protein leads to better satiety ("fullness") than carbohydrates, which is in turn, is better than fat. Incidentally, when I say "fat," I am referring to saturated fat and not the omega-3 fats, EPA (eicosapentaenoic acid) and DHA (docosahexaenoic acid), since when these are combined with high protein foods, they improve satiety. Additionally, EPA and DHA have additional benefits in that they improve most of the medical conditions associated with obesity. Increase Physical Activity: It seems intuitive that increasing physical activity will lead to weight loss, but significant weight loss from physical activity is the exception. However, increased physical activity improves the fullness experienced after eating and does improve physical conditioning. Increased physical activity is critical for weight maintenance; studies show that it takes the equivalent of 60-90 minutes of brisk walking daily to maintain weight loss (please see the section above on exercise). Behavioral Modification / Lifestyle changes: Every individual is unique in their personal lifestyle and habits. A behavioral modification / lifestyle intervention program will help you identify behaviors that are contributing to your weight. Such programs assist in recognizing situations/events that contribute to overeating, identify and modify food choices and portion sizes, help you increase your physical activity, and help you to develop healthier habits. These programs are available in books, through weight management programs, and through health professionals (incidentally, we provide one online for our customers). All weight management programs, be it self-directed or professionally directed, should supply such programs to facilitate improved results. Working with your health professional: Asking your health professional for guidance and assistance is recommended. First, obese individuals are prone to many silent medical conditions and a thorough medical exam prior to starting on a dietary intervention with increased physical activity is only prudent. Additionally, your health professional can assist with treatment of any associated depression or eating disorder that is pervasive in the overweight and obese population. These conditions may require the use of medications, something only you and your health professional can ascertain. Without addressing such conditions, it becomes extremely difficult to effectively lose and maintain a lower body weight. Please remember that treatment of overweight and obesity is a process, not an event. It will take time and there will always be ups and downs. Also remember that it isn't a matter of going on a diet, losing weight and then reverting to your prior diet and habits; if you do this, your weight will return with a vengence. You must be ready to make incremental, long-term changes to effectuate long-term weight loss and weight maintenance.